I am a big fan of Andhra style Pacchadis which is usually mixed with hot rice and ghee.Ideally Pacchadis are prepared in a stone mortar, as in the olden days and hence these kind of pacchadis are called 'Roti Pacchadis', where 'roti' stands for 'stone mortar' in telugu. Pacchadis can be prepared with various vegetables, greens and dals and the texture should be very thick and slightly coarse unlike the chutneys we prepare for the breakfast items. 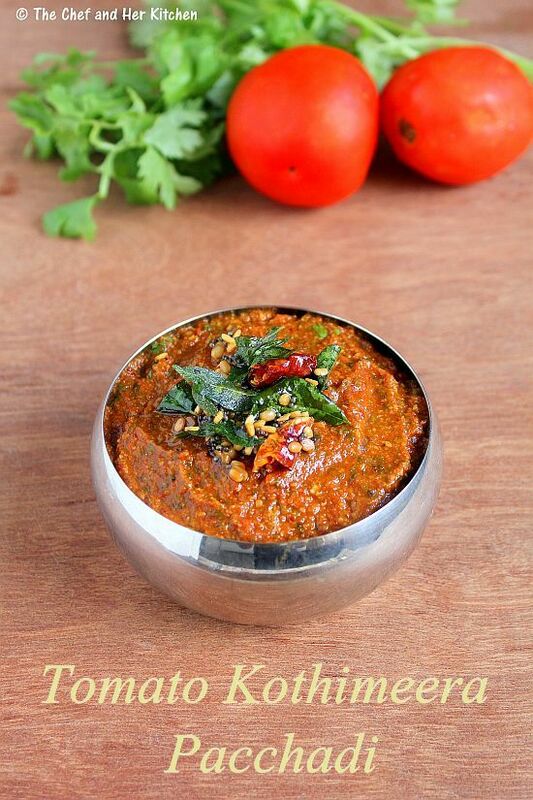 Today I am sharing a simple Pacchadi recipe with Tomatoes and coriander - Tomato Kothimeera Pacchadi which serves as a nice combination with rice. Check out other Andhra style roti Pacchadi recipes here. Clean the coriander leaves and retain tender stems along with the leaves and chop it roughly. Heat oil in a pan/kadai and add urad dal and roast until it turns slight red in color.Remove and keep the urad dal aside. In the same pan add cumin seeds and red chillies and fry them until they are roasted and remove them aside. Now in the same pan add chopped tomatoes and fry for a minute and cover it and cook until it turns pulpy.It takes 4-5 mins. Add chopped coriander leaves along with the tender stems and tamarind to it and fry for another 3-4 mins until the mixture becomes slightly dry.Cool the mixture slightly. Grind roasted urad dal with roasted red chillies,cumin seeds and salt to a coarse powder.Add cooled tomato - coriander mixture and grind it to a coarse paste.I usually do it in whipper mode to get slight coarse and pulpy pacchadi. Heat oil/ghee in a small tempering pan and crackle mustard seeds and add urad dal and red chillies,curry leaves and asafoetida and fry until they wilt and add this tempering to the pacchadi. Serve it with hot steamed rice and ghee. You can store it in refrigerator for 2-3 days in an air tight container. 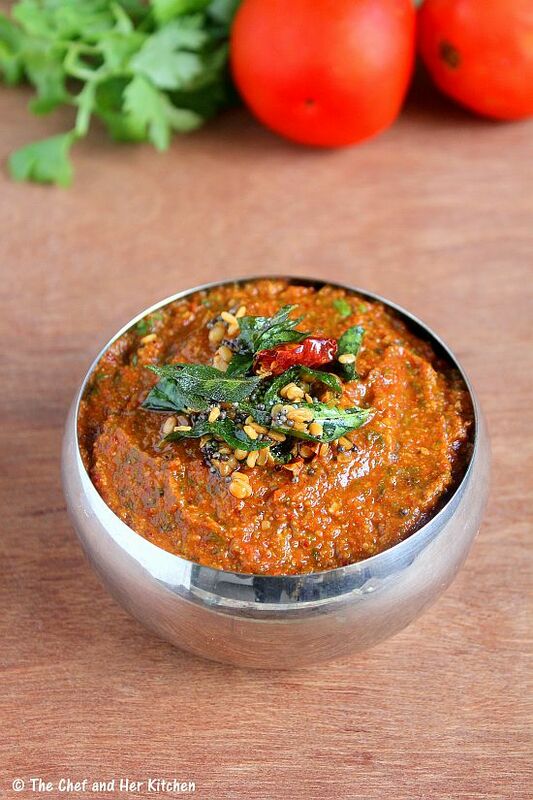 If you are preparing this chutney for Idli or Dosa,grind the chutney to a smooth paste instead of coarse paste. If you find the pacchadi very tangy add a pinch of sugar or jaggery while grinding the chutney. Adding jeera to the pachadi paste is a new flavour for me, I love the thick spicy Andhra pachadis too and your site is a delight with so many pachadi recipes! Has anyone tried to preserve this type of chutney? I would like to make this, and then seal it in hot jars to preserve. would you need to add vinegar or something for it to be able to keep ?